Most of Ruaha National Park was once the home of the Wahehe people. Long before the Wahehe arrived, scattered groups of hunter gatherers temporarily lived in the area. In the Mwagusi Sand River area, anthropologists called them Kosi Samba. In 1910, the German colonial administration created the Saba River Game Reserve. This was re-gazetted as the Rungwa Game Reserve in 1946 by the British who had been given a mandate to run Tanganyika by the League of Nations, after Germany's defeat in the First World War. The people living in the new protected area were subsequently forced to move out. 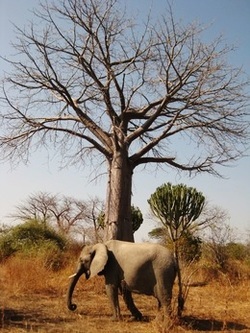 Ruaha was formally gazetted as a protected area in 1964, three years after Tanganyika got independence from Britain. The park encompassed the southeastern area of the Rungwa Game Reserve and was elevated to full park status. Previously the park covered an area of 10,330 sq km but in early 2008 the park was extended virtually overnight to its much larger current size of 20,226 sq km including an additional 4,500 sq km of grassland and swamp. Ruaha is now the largest National Park in Tanzania (the second largest park in Africa) and forms the core of a much larger ecosystem of 150,000 sq km, named the western corridor.